The Carbon-Z™ Yak 54 is a quantum leap in unlimited aircraft design that uses patent pending Carbon-Z construction. 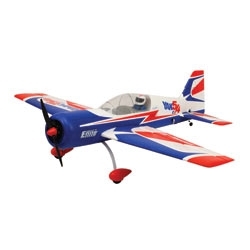 The brainchild of world aerobatic champion, Quique Somenzini, it comes out of the box equipped with the phenomenal brushless Q-Power system and digital high-speed servos. The combination of these high-performance components with the light weight and superb rigidity of the Carbon-Z airframe result in a 3D airplane with a 2:1 thrust-to-weight ratio that knows no limits. Best of all, you can have this Plug-N-Play® version airborne in just a few minutes. All you need is a full range aircraft transmitter and receiver, a 4S 14.8V 2800mAh Li-Po battery, and a 4S Li-Po charger. To get the most from the Carbon-Z Yak 54, a programmable aircraft transmitter with dual rates and exponential function is recommended.